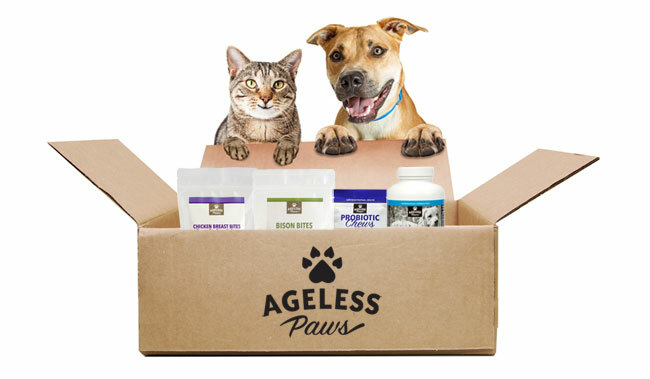 Ageless Paws freeze dried cat and dog food topper is a healthy and convenient way to supplement your pet’s diet with the delicious and all-natural protein and flavor of wild-caught Atlantic salmon. From the sea, the salmon then is freeze dried while raw to preserve freshness and nutritional integrity. It is then ground into a fine powder, which you sprinkle over your pet’s food from a convenient shaker bottle. 100% salmon, this freeze dried cat and dog food topper is naturally grain-free. No fillers, preservatives, additives, and artificial colors or flavors, just pure wild salmon nutrition for picky eaters and “woofers” alike. Dr. Sinatra, a physician and certified nutrition specialist and pet lover, believes it is important to choose only the healthiest foods and treats for our beloved canine and feline companions. He likes wild salmon for both people and pets because of its coenzyme Q10 and omega-3 fat content. That is why he hand-selected this delectable freeze dried cat and dog food topper – because it is made with nothing but wild Atlantic salmon – something you can feel really good about giving. cats and dog were just so so about it. My dog is so picky that she wasn’t enticed by this food topper, but I had my daughter’s dog at my house and he loved it.